Hyderabad: Tennis star Sania Mirza, mother to three-month old Izhaan Mirza Malik, feels there is still some tennis left in her career. But the exact date of return to competitive tennis would be known after her three or four weeks of intensive training which will commence in Dubai shortly. 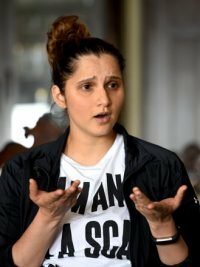 When the topic on cricket and the new emerging face of Indian sport, Sania said she liked the aggression of Virat Kohli. “Virat is obviously a very aggressive captain and I am huge fan of Virat. But I think Sourav Ganguly was a very aggressive captain as well which is where he got India where it was. So was Dhoni although he didn’t have persona to be aggressive. Everyone has a different way of showing in their game. She did agree that there are opportunities in India other than cricket now. “We are not here to say that Virat makes this much… when I started, I was obviously the first women’s sports person to do an endorsement. But things have changed. We have got superstars outside cricket. I love cricket, I will always be partial towards it. I think any other sport can compete with cricket in the country. Cricket is like a religion. If you say it is difficult for any other sport, it is stupid.